If buying a house feels just out of reach, you might be closer to homeownership than you realized. When you piggyback your mortgage—taking out two loans instead of one—you can avoid paying Private Mortgage Insurance, an additional monthly payment required when your down payment is less than 20 percent of the home’s purchase price. 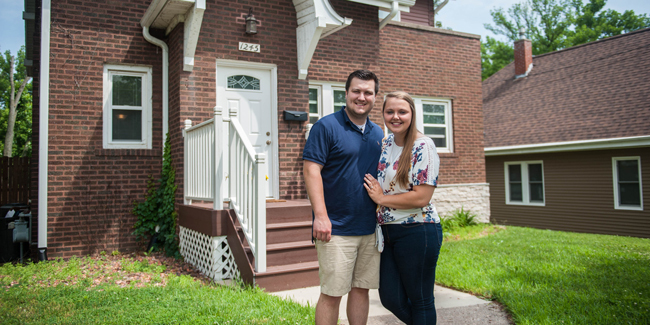 Dupaco members Tom and Rebecca Ameche used the 80/15 loan option to purchase their first home. The newlyweds took out two mortgages to avoid paying Private Mortgage Insurance. The first mortgage was for 80 percent of the home’s value, the second for 15 percent. By piggybacking the loans—an option for qualified borrowers—the couple saves $160 in monthly PMI payments. PMI protects the lender in case you default on your loan, but the payments can be costly, sometimes making homeownership unattainable, for borrowers. Many Dupaco members have been asking how to avoid paying PMI when their down payment isn’t enough. We began offering the second mortgage option, also known as an 80/15 loan, last year to help homebuyers do just that. This option isn’t for everyone, but it can be an invaluable tool in certain situations. Related: Are you ready to buy a home? Most homebuyers, 59 percent of them, use a conventional loan to finance their homes, according to the National Association of Realtors’ Home Buyer and Seller Generational Trends Report 2017. With a conventional loan, your mortgage is for a fixed term and rate. With an 80/15 loan, you take out two mortgages, with the first mortgage for 80 percent of the home’s value and the second for 15 percent. The other 5 percent is your down payment. By not paying PMI, you can start paying off the principal of your loan balance faster. You must pay at least a 5-percent down payment. The second mortgage is a 20-year loan. It’s also a 5/1 Adjustable Rate Mortgage, which means the interest rate is fixed for the first five years and can adjust annually after that. Your loan must be at least $5,000. Many first-time homebuyers who would otherwise have to pay PMI are taking advantage of the 80/15 loan. It works well when one borrower doesn’t have a stellar credit score. But there are some drawbacks to consider. Some borrowers don’t like the risk of an increased mortgage payment that comes with the second mortgage. After the first five years, the second mortgage’s interest rate can change every year, based on the 1-year LIBOR index. The rate can’t go up more than 2 percent in a year, and it can’t go up more than 6 percent during the life of the loan. And because you already have a second mortgage, you can’t apply for a Home Equity Line of Credit until that loan is paid off. So, is it better to hold off on buying that house until you can afford a 20-percent down payment? Not necessarily. If you can get into a home by paying only 5 percent down—and can make the mortgage payments work with your budget—you can start building equity, which is something you can’t do when you rent. It all comes back to your credit. Your credit score will impact your closing costs, interest rate and even how much you pay in PMI (the lower your score, the higher your PMI payments will be). It’s so important to understand what your credit score is and how you can improve it. A makeover specialist can pull your credit, talk to you about how to build your score and start preparing you for the homebuying journey. If you’re thinking about buying a home in the next year or two, take advantage of this opportunity so you’re ready when you find the perfect house down the road.